I changed the season, and focused on the colours, the layout, the grey stripes and the fact that there were two sheep. And the use of DP. Yes I have some. An embarrassing amount, actually, especially for someone who rarely uses it! 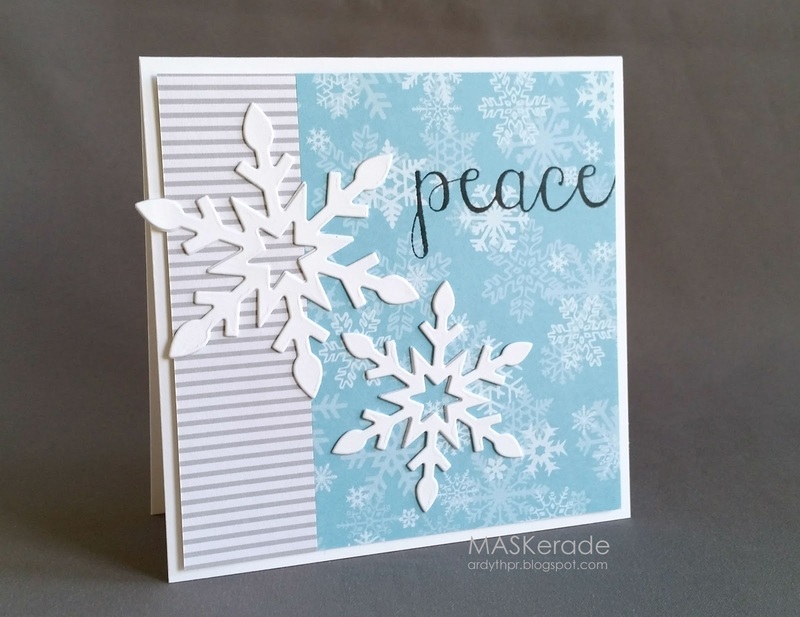 I used my new Clearly Besotted Snowflake Trio (I left the littlest one out for this card) and a Creatiate sentiment. I hope you'll get a chance to play along. The deadline is on Monday at 8 am EDT. At that point, voting opens and you can vote for your 3 favourites (even if you didn't link up a card) until Tuesday at 8 am. The results of the voting will be posted at noon. Hope to see you there! What a gorgeous card! Love the snowflakes and pretty sentiment. It sounds like your DP is used the same way as mine.. to look at lol. I've seriously been trying to use some of mine and I know that I could craft for a year a probably make just a small dent in mine. As usual your card ROCKS Ardyth, you can always pick the best parts of a project and make them better! This is so lovely. Everything about this card says peace, not just the sentiment.